Research charities, hospitals, and London boroughs have combined to launch a new global hub for cancer research and treatment in London, with the aim of accelerating the discovery of new treatments. The London Cancer Hub is a partnership between The Institute of Cancer Research, London (The ICR), The Royal Marsden NHS Foundation Trust and the London Borough of Sutton. 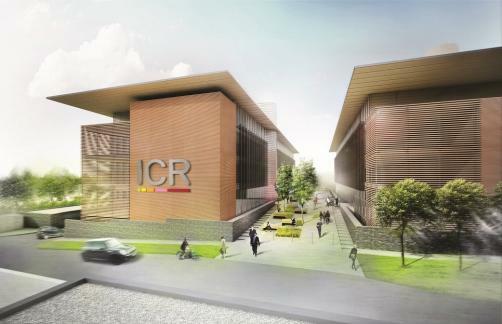 It will be developed on the Sutton site of The ICR and The Royal Marsden, and is planned to cover 265,000 square metres – double its current research and treatment space. The initiative aims to bring together 10,000 scientists, clinical and support staff in a vibrant community of collaborating organisations served by research, educational and leisure facilities. It will be a hotbed for talent, offering research and development space for biotech, pharma and software companies, and equipment manufacturers. New buildings will closely integrate research and cancer care – providing both laboratories and clinical facilities, in order to actively drive interactions between scientists and clinicians. The initiative aims to build on the world-leading position the partners already hold in drug discovery and development, and will potentially create more than 13,000 jobs and will deliver at least two extra cancer drugs every five years. ICR chief executive Professor Paul Workman says: “This is a fantastically exciting project to create the world’s leading cancer research campus here in London. The Mayor of London Boris Johnson adds: "London is already a global capital of science and is awash with numerous exciting research institutions. The London Cancer Hub would be a real coup for the city and would help to ensure that the capital remains on the frontline of developing new treatments to cure the disease."